If you’ve been in the content marketing business longer than about five minutes, you already know: this social media thing is trickier than it looks. It takes time and effort. There are unwritten rules about things like when and how often to post, how to acknowledge your sources, whether to include visual content, and if so, how much…and of course, each platform has its own quirks. Google+, as a relative latecomer to the social media platform party, can feel especially difficult at first. Its structure is markedly different from our old faithful standbys, Twitter and Facebook; and what’s with this whole “circles” deal? 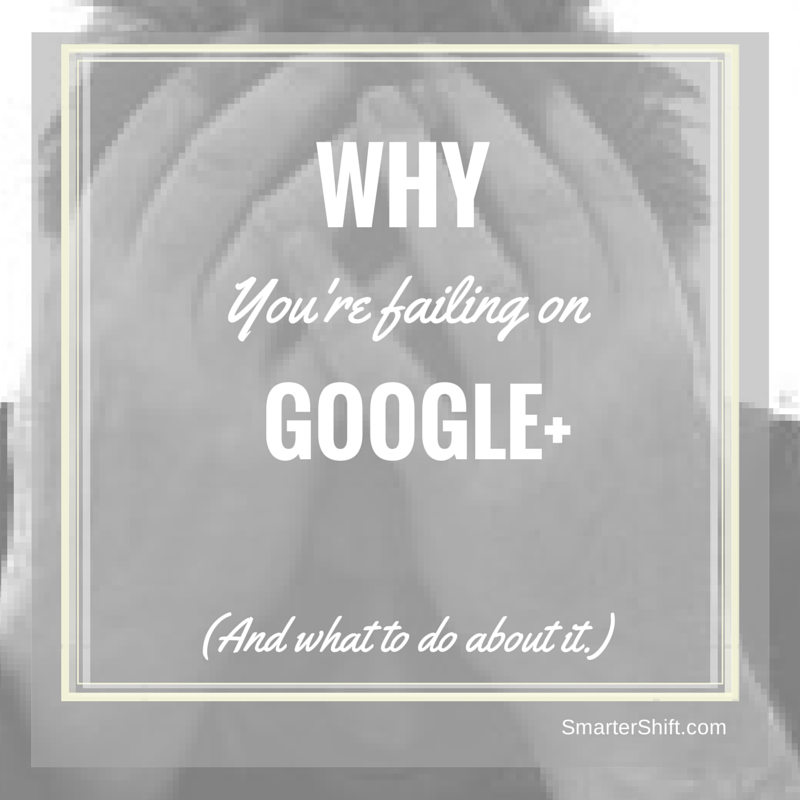 Don’t give up on Google+ yet! As Smarter Shift’s Google+ specialist, I’m convinced of the site’s value. I’ve found it an excellent place to meet, catch up with, and learn from some pretty high-flying specialists in fields that pertain directly to our business—and if content marketing is all about the relationships we build and nurture online, Google+ is definitely a happening place. When you first open your Google+ profile page, you’ll find a space for your profile picture, and a header background that’s filled with multi-coloured flags. Ditch them in favour of a decent head-shot of yourself or your company’s logo, and a high-quality background picture or graphic…preferably one that tells your followers something about who you are and what you do. Once you’ve taken care of the decor, take some time to complete your profile information as thoroughly as possible. You’d be surprised at how many people simply fail to do this…and remain anonymous (and pretty much ignored) as a consequence. If you’re rushing in, dropping a bunch of links to your latest blog post or product announcement, and then rushing off to attend to your Twitter feed, you might as well save your time. While your links may show up in a few people’s feeds, if you add nothing to draw attention to them, they’ll be quickly passed over. If there’s one thing worse than being a link-dumper, it’s being a serial link-dumper: that’s the person who posts five or six (or more!) raw, non-curated links at the same time…and then leaves, thinking their job is done. Instead of dropping links and hoping for the best, why not focus on adding value to your Google+ posts? Think of each post as an opportunity to create a mini-blog, with your link as the focal point. Why are you posting it? Who will it benefit? What value do you want your readers to take away from it? And if you’re sharing someone else’s post, who originally shared it with you? It’s a nice touch to offer them a “hat tip” (h/t)…and it ensures they’ll see that you’ve shared their stuff. Remember: On Google+ you are a knowledge curator, not a broadcaster. Your job is to offer up the best content you’ve got, in the best package you can, and to share others’ posts to add value to your followers’ experience. While we’re talking about best practices, here’s an important tip: keep your finger off the “Also send email to your circles” button! I know, it sounds like a dream situation: the ability to send your posts directly to everyone in your circles! But using this feature without explicit permission from the recipients constitutes spamming them. And we all know how we feel about spammers, right? Here’s a screen shot from an actual Google+ account, showing how well different post types perform. Note that simple links get almost no interaction—a paltry .3 actions (plus 1, comment, or share) per post. Hardly worth the effort, right? Similarly, text-only posts don’t fare that well, with .7 actions per post. However, posts that contain images—photos or infographics, your choice—do much better; in this case, they averaged about 5 actions apiece. Embedded videos do even better, although in this case it was based on a sample of one. Ultimately, the lesson is that the more effort you put into making your Google+ posts visually impressive, the better results you can expect. At first glance, circles might make little sense to the Google+ newcomer. But think about it: with circles, you can create customized lists of interest groups, and use them to target who sees your content. For example, you might want to send some of your posts to your clients, and other posts to your association members. Go for it! As for incoming posts, you can create a circle of people whose posts you’d like to see more of, because Google+ allows you to set your notification levels to low, medium, and high. I have a circle I named “Notify me,” in which I’ve placed the 20 or so people I really want to hear from whenever they post. Google+ is home to some very active communities covering a huge variety of topics, and most of them are open to anyone who’d like to join. In fact, posting to relevant communities can be a great way to start making a name for yourself, because in a community, all members (not just those who follow you) can see your posts. 5. Don’t be a stranger! To get noticed on Google+, you must get into the habit of engaging: ask questions, answer questions, comment, share….remember, you’re there to add to the conversation. You really don’t want to be “that person” who dumps a bunch of links, but never reads, comments on, or shares anyone else’s posts. If you see yourself in this description, though, don’t worry: one great thing about social media is that redemption is always possible. If you mend your ways and become a participating member of the Google+ community, all will soon be forgiven. And you’ll find that your own posts get shared—a nice side bonus, I’m sure you’ll agree. Like most social media platforms, Google+ is continuing to grow and evolve, adding new features, dropping others, and tinkering with the details. If you want to get the most from it, you’ll want to keep learning and deepening your knowledge. Once you’ve been there a while you’ll begin to realize that Google+ is chock-full of people who are more than willing to share their knowledge and expertise with you—that’s part of what makes it such an awesome online community.